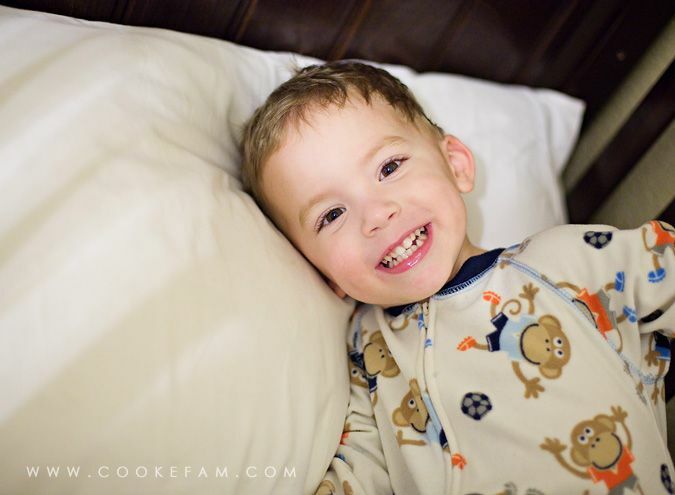 At the beginning of this month, we moved Logan to a big boy bed and out of his crib. It's weird how your younger child always seems younger to you than your oldest did at the same age. 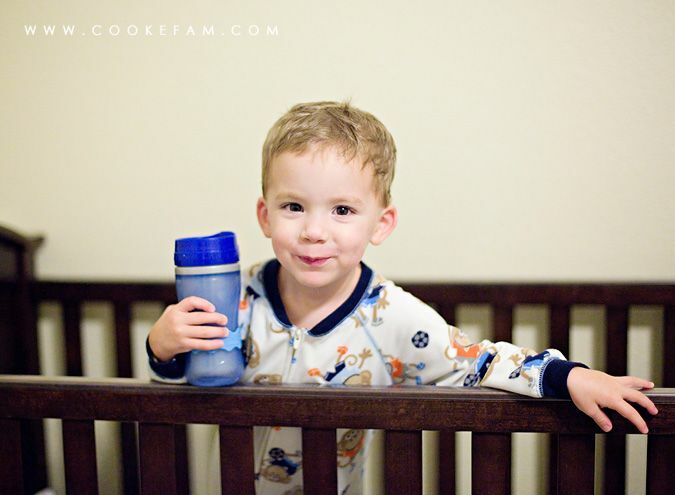 Ethan moved from his crib to a big bed when he turned two, about 6 months earlier than Logan made the switch. 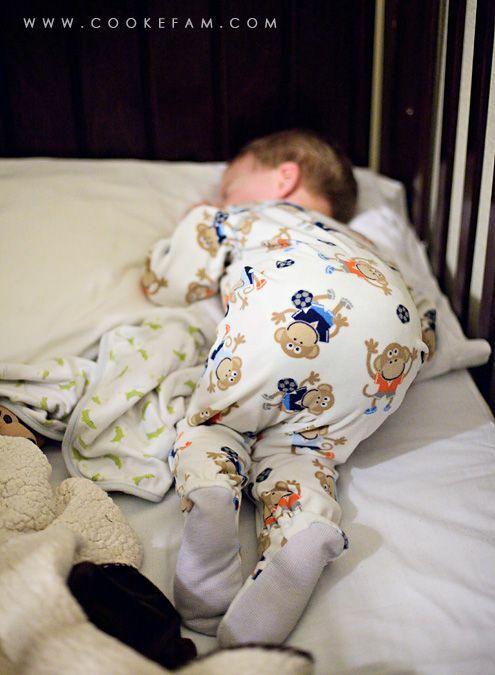 But, at the time, Ethan had to give up his crib for his new baby brother. Neither one of our boys has ever climbed out of their crib. I think they both loved sleeping in it. But they both did great with the change to a big bed. I don't care if you have 2 kids or 20, if you're a mom (or dad) you will more than likely be emotional about taking down the crib for the last time. I didn't take photos of Ethan's last night in his crib or his first night in his big boy bed, but I wish I had. 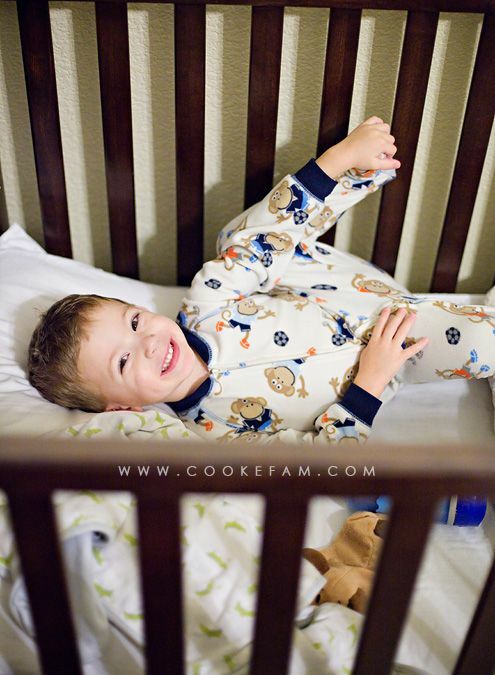 So, first up is Logan's last night in his crib. 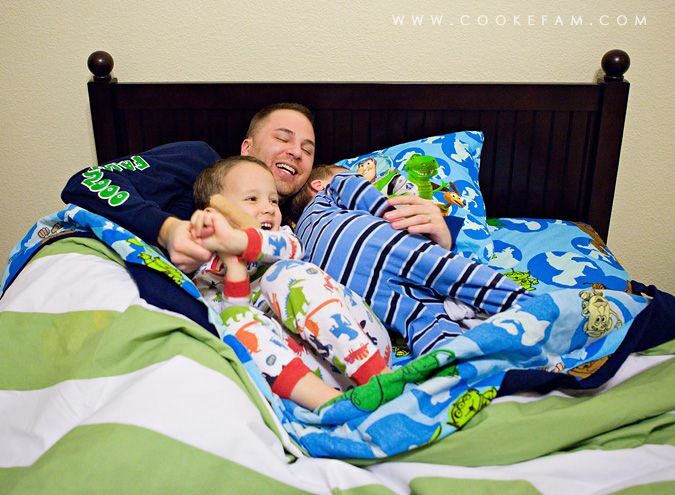 With both of our boys, we put a pillow in the crib with them a while before transitioning them to a bed. I am not sure if it helped or not since we've done it with both and have nothing to compare it to, but the idea was to get them used to sleeping on a pillow. 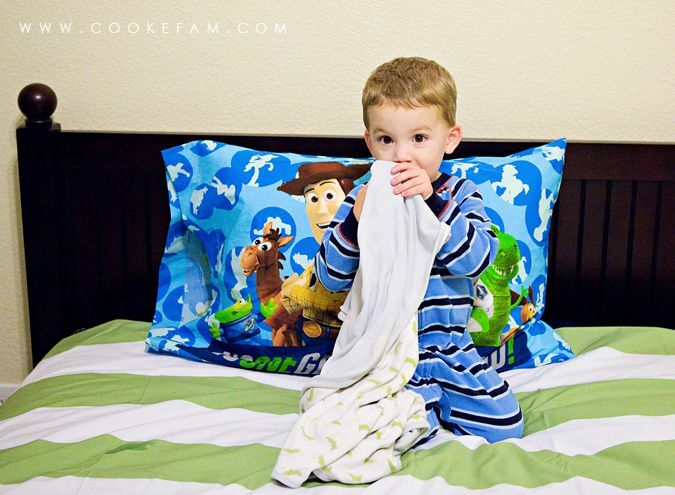 We also added covers (a blanket) for Logan since it gets cold in his room so he was used to sleeping with that as well. Logan still loves to sleep on his tummy like this, although he also sleeps on his back sometimes. Of course his blanket is in there and you can just barely see puppy's face. 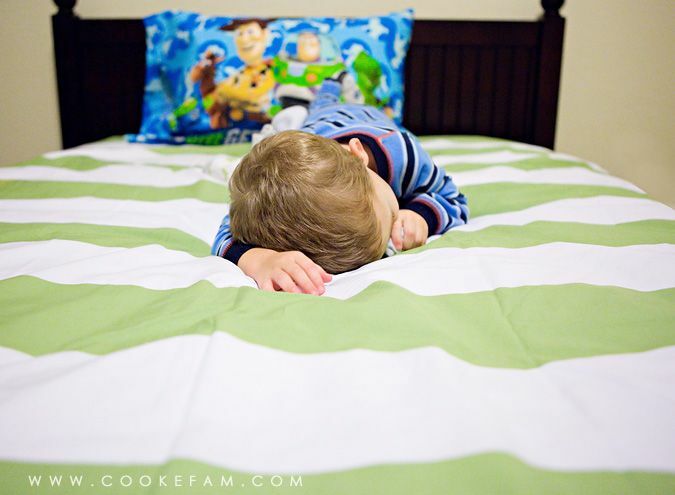 The very next night, Logan spent his first night in his new big boy bed. We got both of the boys full size beds thinking of the future and they've both done great with them. 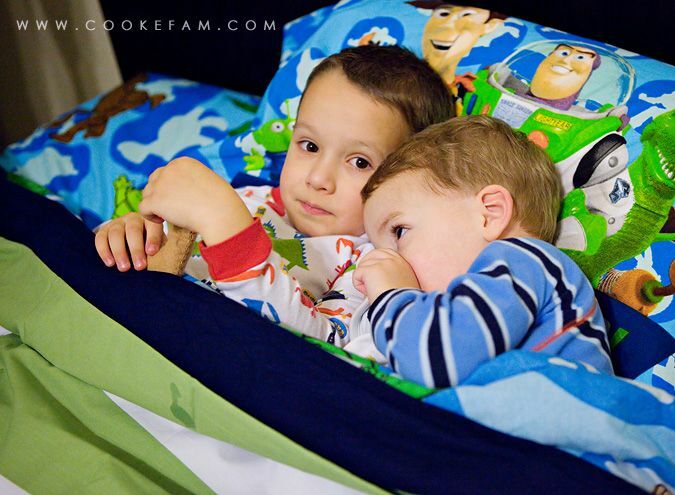 Casey and I love the fact that we can all lay on one of their beds at bedtime and read stories together. 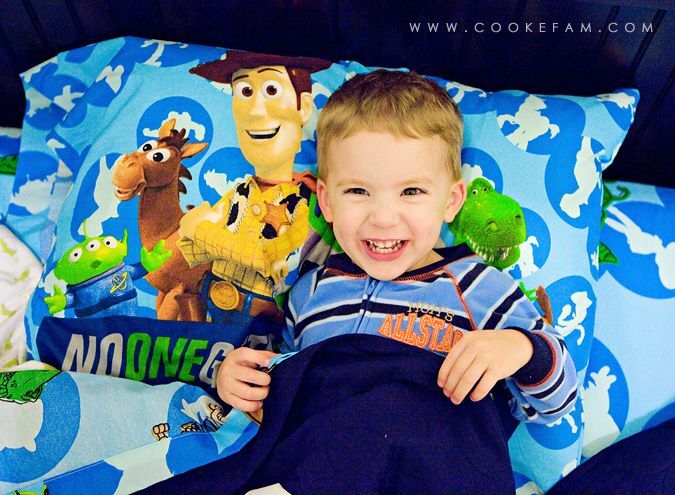 Logan got to sleep on his new Toy Story sheets that Nonnie and Papaw got him for Christmas (he was thrilled about them on his bed). 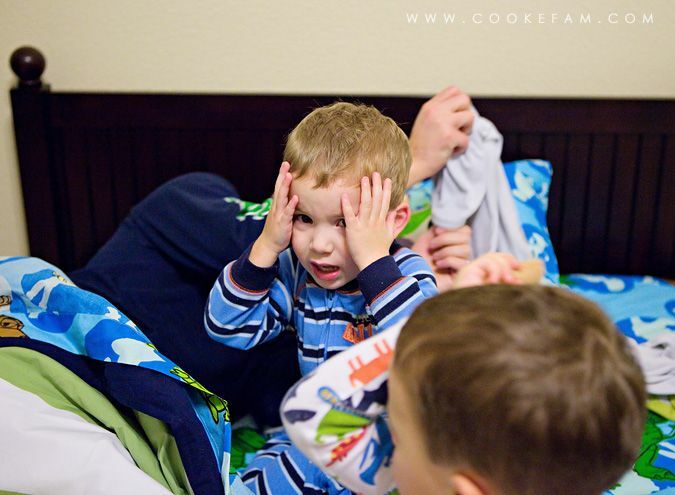 Ethan was excited for Logan to have a big bed like his. He hopped into bed with him like Logan does in his bed. How sweet are they? Then daddy jumped into the mix and stirred things up a little. 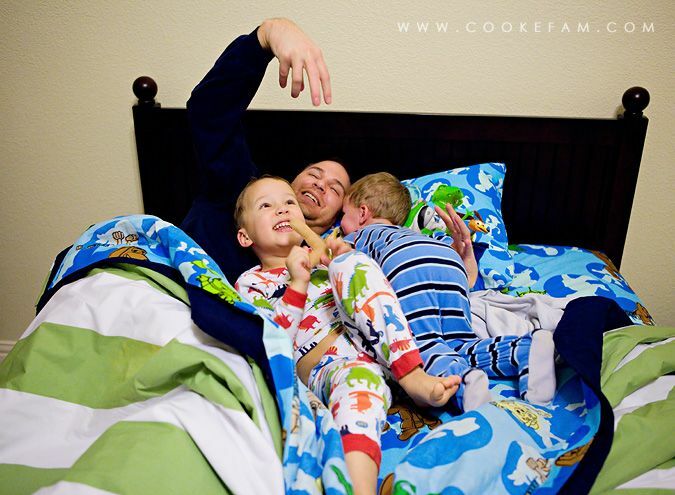 This is very, very common at bed time in our house...tickling. At some point Logan's head got bumped and he'd had enough of the shenanigans. 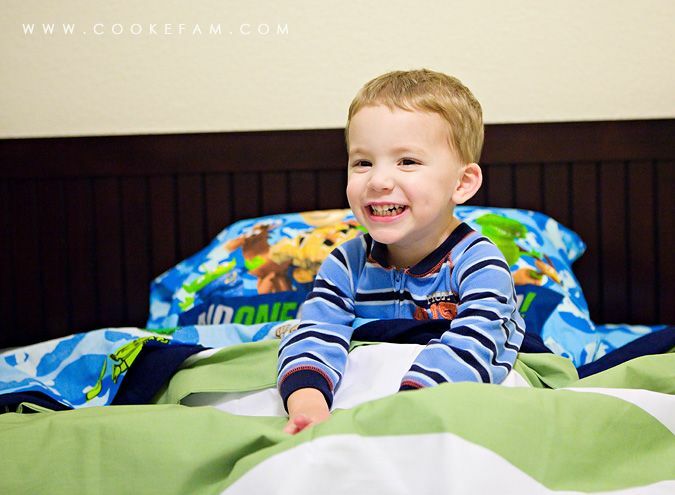 But returned to smiling after everyone vacated his bed. All settled in and ready to sleep! The first night went amazingly well. He didn't get out of bed at all and fell right asleep. Subsequent nights have gone just as well. He has only tried his door once and then went back to bed after finding it locked. We keep it locked for safety (because I do not need my 2 year old roaming around...upstairs...at night - I do have a monitor so I can see/hear him), but it also has the handy effect of keeping him in his room too. And just like Ethan, there's no toys in there so he just sleeps. Such a sweet big boy.